Did you learn about Tsunamis when you were in school? Not only did I learn about them, but I also taught about this phenomenon of nature to my sixth grade science students. I still remember the news in 2004 of the giant tsunami that hit Southeast Asia. It was all over the news and students in the school I worked in raised money to send to the people in the area. As I sat and watched specials and shared them in class, I remember thinking about the horror of living through one of these natural disasters. First the earthquake and then the possibility of a giant wave coming onto the land and sweeping everything away. Just seven years later, on March 11, 2011, an earthquake with a magnitude of 9.0 rocked Japan for several minutes. Tsunami warnings went out immediately after what later was noted as the largest recorded quake in Japan and fifth largest in the world. After the tsunami was over and people started to look for survivors and clean up, they noted a massive problem with the nuclear power plant as a result of the earthquake.This is the premise for the eighth book in the I Survived series by author Lauren Tarshis. I received an advanced copy of this book to read on my Kindle from Scholastic. In I Survived the Japanese Tsunami, 2011, we meet Ben who lives in California. Ben recently lost his father while he was serving in Afghanistan. As the book begins, his family decides to go to his father’s hometown of Shagahama, Japan to visit his uncle. While there, an earthquake strikes and his family is able to escape the rubble that is left in the house. As they get into their car to escape from a potential tsunami, the water comes inland and sweeps them out of the car. Ben is separated from everyone and must work hard to stay alive as he is thrown into the debris of the tsunami. We follow along and get to see just how he survives the disaster and whether or not he will be reunited with his family. As in the other I Survived books, Tarshis does an amazing job weaving facts from a tragic event into a fictional tale. Ben could have been there and his story easily may represent some other child that had been living in Japan at the time of the tsunami. Tarshis gives just enough detail where young readers will understand the basics. In this book, readers will not only learn that an earthquake precedes a tsunami, but how large items are swept away with little effort by the strong waters. She also addresses destruction left in the aftermath including the nuclear power plant that was damaged and caused people to flee parts of Japan. As you read, you will feel the tension as Ben battles to survive. 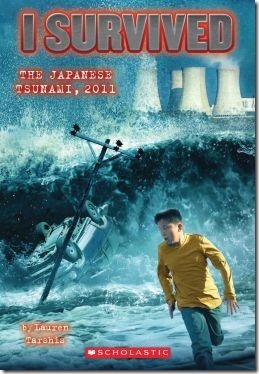 This book would make a nice addition to a science discussion on tsunamis and earthquakes to tie in with a Language Arts curriculum. Do you or your children like to read historical fiction stories? I would love to know if you have read any of the other I Survived books? As always, please share what you have read recently. Be sure to link up to your book posts in the comments below. Include something you read on your own, with a child, or someone else. Tuesday Tales are all about spreading the love for books. My review of I Survived: The Battle of Gettysburg, 1863 may be found on a February Tuesday Tales. Disclosure: I received a NetGalley preview of this book courtesy of Scholastic Books in order to facilitate this review. No other compensation was given. The opinions expressed in the review are my own. The tsunami approaching the coast drawing is by Veitmueller via WikiMedia Commons.